Cozy is a costless dynamic property management software. Other than the fact that it is free, it is also cost-efficient when it comes to applicant screening. That is because prospective tenants are required to shoulder the fees for credit and background checks. This way, you can rest assured that you are transacting with reliable individuals. While all other tools included in Cozy come at no cost, rent estimates and property analyses are for a fee. Nevertheless, the amount you have to pay is only minimal. And considering these features are not frequently used, you can further keep tight control of your budgets. Moreover, when it comes to your property finances, you can rest assured that Cozy can help you in that regard as well. The solution automatically collects rent from tenants’ accounts and deposits the fees to your bank. 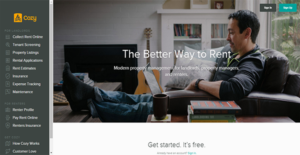 With Cozy, you no longer have to knock on tenants’ doors to collect rent. The software allows you to collect payments automatically straight from their banks every month. This ensures that they pay their dues on time and makes certain that you keep your business afloat properly. Additionally, Cozy funnels the payments to your preferred accounts. This means that you can add multiple deposit accounts to the application and set them up to receive money from your tenants. Make tenant applications more convenient for you and your personnel as well as for interested individuals. When potential occupants view your properties in a listing website, they are provided instructions to complete a Cozy Renter profile from there that you can review. This lets you view the property they are interested in and relevant details such as pets, income, and employment. Screening applicants can be a costly process. However, Cozy allows you to share that burden with applicants. If they are truly interested in becoming a resident in your estate, they can pay the fees for credit reports and background checks. By making them pay the costs, you can rest assured that you are accepting a trustworthy tenant. Keep your tenants happy by paying attention to their needs, especially to their maintenance requests. Cozy has a dedicated portal where residents can create requests that include details, as well as photos and videos. This lets you assess the problem carefully before sending in your contractor to fix the issue. Additionally, you can notify your occupants via the same window of the maintenance status and schedule. Cozy has partnered with Assurant, an insurance provider to keep your property and your tenants insured. This protects you from steep financial costs and possible legal actions. With this, you can gain a peace of mind that you have covered all your bases. If you are considering Cozy it could also be sensible to examine other subcategories of Best Property Management Software collected in our database of B2B software reviews. Organizations have unique wants and requirements and no software platform can be ideal in such a situation. It is futile to try to find an ideal off-the-shelf software system that meets all your business requirements. The wise thing to do would be to modify the solution for your specific requirements, worker skill levels, budget, and other factors. For these reasons, do not hasten and subscribe to well-publicized popular solutions. Though these may be widely used, they may not be the perfect fit for your specific needs. Do your research, look into each short-listed application in detail, read a few Cozy reviews, speak to the maker for explanations, and finally select the product that offers what you want. Cozy is a free to use software and so does not have enterprise pricing. However, the solution charges rent estimates and property analyses at $19.99 each. We realize that when you make a decision to buy Property Management Software it’s important not only to see how experts evaluate it in their reviews, but also to find out if the real people and companies that buy it are actually satisfied with the product. That’s why we’ve created our behavior-based Customer Satisfaction Algorithm™ that gathers customer reviews, comments and Cozy reviews across a wide range of social media sites. The data is then presented in an easy to digest form showing how many people had positive and negative experience with Cozy. With that information at hand you should be equipped to make an informed buying decision that you won’t regret. What are Cozy pricing details? What integrations are available for Cozy? Cozy can integrate with Realtor.com and Doorsteps for listing your properties. If you need more information about Cozy or you simply have a question let us know what you need and we’ll forward your request directly to the vendor.